Do you need a dispenser for your KC4980 or KC5855? Look no further! This is the dispenser you need. Alright, so you're looking for dispensers? You couldn't have arrived at a better place! We stock a HUGE range of dispensers, and all the consumables to fill them. You never need to look anywhere else! We have fit out all kinds of bathrooms, washrooms and kitchens of all sizes. From households, to gyms, to schools, to factories, to sports clubs, to restaurants and everything in between, we've been there! So we can help you find the ideal hygiene solution for your premises. We know it can be a little confusing at first glance, but that's why we are here - to help! We've provided little tips to help guide you to the ideal product for your circumstances, but if at any point you have a question, see that number at the top right hand corner of your window? Call it! One of our friendly staff will be more than happy to assist you. Heavy duty foam filled thick tape for mounting dispensers, where you need that extra support or simply cannot use fixing screws. Depending on the type of dispenser, some my not be able to use this while others may need a few extra pieces to bulk out the voids to get over the screw holes. 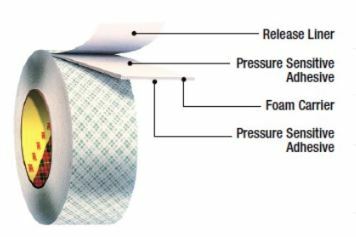 3M™ Double Coated Urethane Foam Tape 4016 is a thick, double-coated open-cell urethane foam tape with a 62 lb. densified kraft paper liner and is ideal for applications such as mounting.